Rabbit is excited: his friend Robot is coming to spend the night! Rabbit has left nothing to chance and has drawn up a list of all the things they will do. First off is making pizza, but Robot only likes nuts and bolts and screws on top (good thing he has magnetic hands). Next on the list is watching TV, but the remote is missing, and Rabbit is panicking! Will Robot find a logical (and rather obvious) solution to the problem? Number three is . . . uh-oh! Why is Robot lying down instead of playing Go Fish? And what is that message reading "BAT" printing out from a slot on his front? New readers who like silly stories will race through this funny adventure about a rabbit who likes to be in control and an obliging robot who calmly keeps their friendship humming. Cece Bell is the author-illustrator of three picture books about Sock Monkey as well as Bee-Wigged and Itty Bitty. She lives in Christiansburg, Virginia. Meet the newest odd couple in the early reader section: fussy, compulsive Rabbit and overly logical Robot. . . .Bell’s crisp, cheery cartooning adds visual punctuation and elaboration in all the right places, and she handles moments of both calamity and reconciliation with aplomb. Delightful. 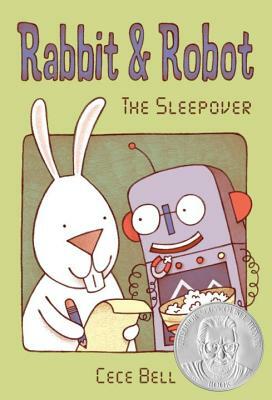 The light ridiculousness of a machine and animal hanging out together provides plenty of yuks (Rabbit tops his pie with carrots and lettuce; Robot prefers bolts and screws), and Bell breaks up the easy-reading text with warm, goofy cartoon illustrations. Kids will welcome these new besties to their early-reading rotation. Make way for another endearing, odd-couple pair of friends in beginning-reader land...A good choice for those ready to launch into more advanced texts. The large font, simple, short sentence structure, and numerous attractive illustrations make this accessible for readers who are beyond Willems’ Elephant and Piggie series but not quite ready for lengthier chapter books. There’s plenty of humor, both in the text and the crisp and simply composed digital illustration. An engaging, well-paced story, told with simple (but not too simple) vocabulary is tough to write, but Cece Bell has nailed RABBIT AND ROBOT: THE SLEEPOVER. Let’s hope it’s the first of a series.